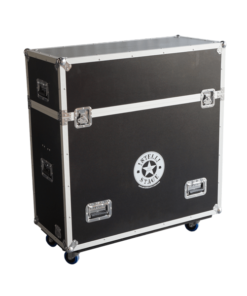 One of the lightest portable stage systems on the market today, Intellistage™ is compact, portable, durable and capable of bearing up to 900kgs per sqm, offering one of the highest load ratings in the industry. 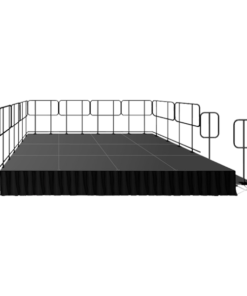 Intellistage™ modules allow you to create custom stages in a range of different configurations, giving you the width, depth and elevation you need for a successful event. 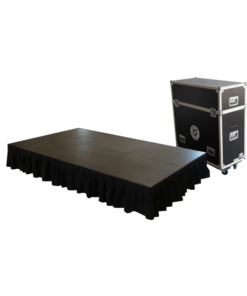 The uniquely designed stage risers have multiple connection points with the underside of each platform, evenly distributing the weight, offering one of the highest safe load ratings for a portable stage. 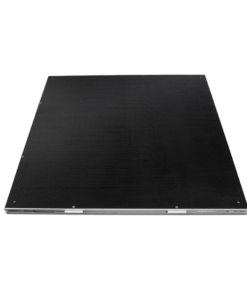 Designed predominantly for indoor use on flat surfaces, Intellistage™ platforms come standard in 1mx1m platforms but a range of different shapes and sizes are available on special request. 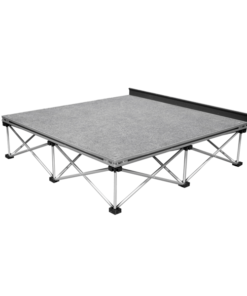 -Platforms are portable, lightweight and easy to assemble. -Modules are durable and can support up to 900kg’s per square meter. -Platforms connect together using an integrated platform interlocking system. 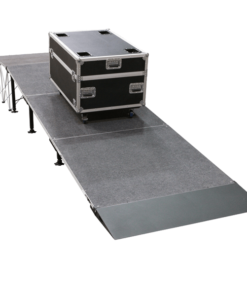 -Platforms: Intellistage™ platforms have a multi-layer design, constructed from 30mm honeycomb and sandwich plywood, with a 2mm Carpet, or anti-slip Phenolic, Industrial finish. 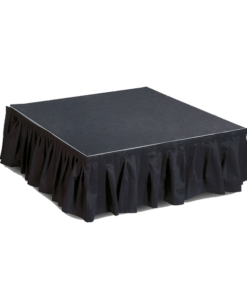 Platforms are reinforced by an aluminum profile on all sides for extra strength and durability. The extrusion features built in interlocking mechanisms and the shallow profile height helps reduce the storage footprint. 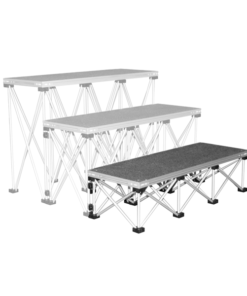 -Risers: Intellistage™ risers feature a unique accordion-style folding mechanism which provides support across multiple points, evenly distributing the weight and offering one of the highest safe load ratings in the industry. 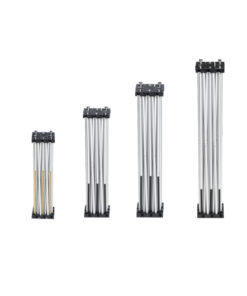 Risers are deceptively lightweight and compact and are locked securely to platforms with a 5mm hex key. -Safe Load Rating: Intellistage™ platforms have received a structural report from EXPO engineering; an industry recognised engineering firm, who have deemed a safe load rating of 900kgs per sqm, evenly distributed.